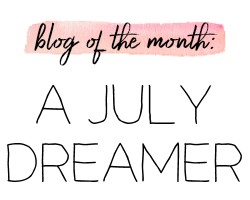 I don't think anyone probably noticed, but I pretty much took the week off from blogging. 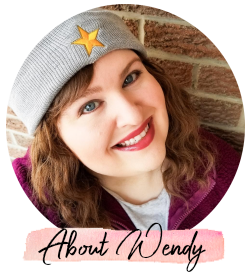 I haven't been on social media much either, aside from an update here and there. They say you're not supposed to pick favorites in family, but we do. And one of my favorite people in the world had a massive heart attack late last week. My aunt Doris is still currently in the ICU and fighting back after a rough surgery. When she's finally released from the hospital, they say she will need 24/7 care for at least two months. She had a great part in my raising. From cheering me every Friday when I marched in the band, to being a refuge to escape from my home life, to making me sweet tea and banana pudding all of the time because she knows those are my favorite things that she makes. From car trips to late nights watching The Golden Girls. It's scary to think that she's not out of the woods. She almost died years ago from blood clots that made it to her lungs and she won that battle. I have faith that she can do it again. She's stubborn and a fighter and I know that will help! With that and a few other things on my plate, it's been a heck of a week. I wanted to try to get back into somewhat of a routine, if only to get my mind off of things for a moment. I just want to thank each of you that have left likes/faves, comments, messages, and emails about my aunt this week. To take the time out of your day to do that is so very appreciated and it does not go unnoticed by me. Doris is so grateful for each of your prayers and thoughts! 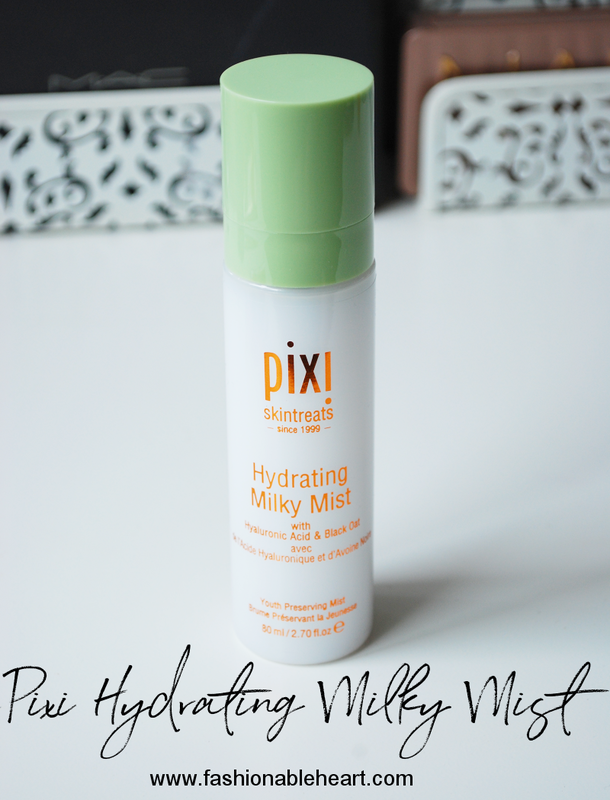 So to get back into my routine, I'm dipping my toes in the water again by sharing my thoughts on Pixi's Hydrating Milky Mist. If you're not new here, you probably have an inkling of an idea of what I think already! Let's see what I think of this Milky Mist! 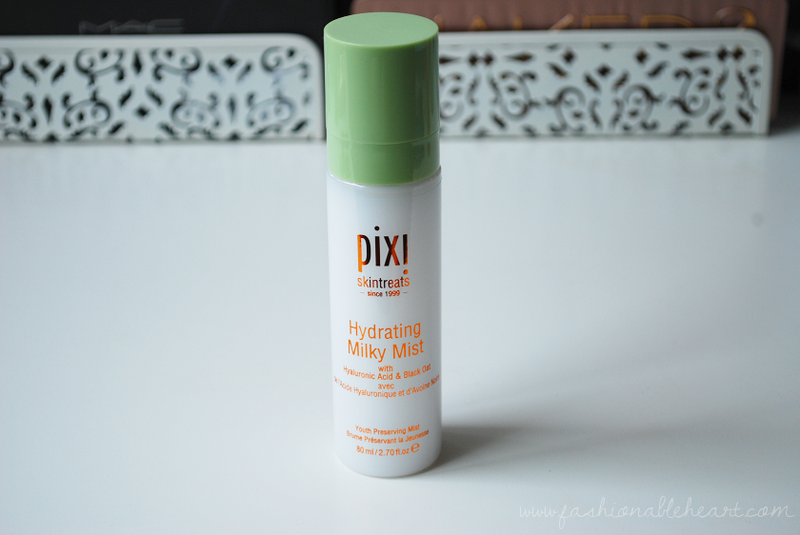 This is my first Pixi product! It's a bit expensive here, so it put me off a bit on trying them. But a few months ago, it was 20% off at the same time that Shoppers was having a Spend Your Points (see my Shoppers Optimum Points guide here) event so I took advantage and picked this facial spray up. First, I cannot say no to a facial spray. Secondly, I cannot say no to the word "hydrating". The minute I saw it, I knew it was coming home with me. I've said it before- I am lazy whenever I can be in my beauty regimen. If a product doesn't need to be rinsed off, hot diggity dog. If I can get great eyebrows in the swipe of a wand, I'm here for it. Lip color that lasts all day? Sign me up! I think that is why I like facial sprays so much. They are so easy. Spray and it does the work for you, but not all are created the same. I specifically like this one for the hyaluronic acid. My dry skin soaks that right up. This isn't just a spray or a mist. It's a full-blown moisturizer and primer and you don't have to rub it in. You don't have to dip your fingers in. You just spray and go. I had my doubts, because it takes a lot to make a difference with my dry skin. This worked on the first try for me and just gets better with each spray. Guys, I'd bathe in it if I could. My skin feels softer and plumper every time I use it. If anything, I wish the bottle was bigger because this stuff goes fast. I need a club size of this bad boy. On other notes, the smell is calming and not in-your-face. The spray nozzle (which I forgot to photograph when I took the product pictures, I am so sorry) works perfectly fine and delivers a fine mist. The formula also includes black oat, provitamin A, linoleic acid, and vitamins B1, B2, and B6, as well as being paraben free. Pixi does not test on animals. If you have dry skin or your skin gets dry during the winter, I think this is perfect for adding to your routine. It's such a simple step! I can say that I highly recommend this item and it will be a repurchase for me when I'm done with my bottle. And since I'm new to Pixi Beauty, let me know if there's anything else I should try. The offerings are a bit limited here from what I've seen, but I have my eye on the Glow Tonic. Let me know if that's a worthy purchase!